Mixed Media Artist: Results: What did you name your business and why? 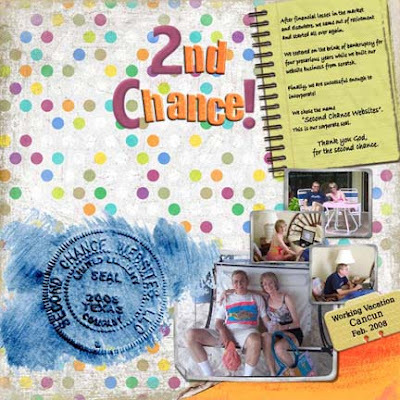 We named our website business 2nd Chance Websites. Above is a scrapbook layout I did about forming the company (also about working on the road - lol) and here's the blog post. We came up with the name because we were - and still are - so grateful for the "second chance" God gave us after losing most of our retirement savings in the dot.com collapse. The name's okay; but with 20/20 hindsight we should have chosen something more descriptive of what we do. Sometimes people ask if we are programmers who take failing websites and give them a second chance at success. No, we're a team (married for 43 years) of: two writers, one artist/crafter and one super-smart guy who has taught himself html and CSS (and lots of other acronyms I haven't a clue about), who were given a 2nd Chance at success and security.